Farmers Market Voucher Program. In 2012, Steward teamed up with the Federation of Massachusetts Farmers Markets to create the Steward Farmers Market Voucher Program. St. Elizabeth’s, along with eight other Steward hospitals across Massachusetts, worked with local farmers markets to develop a farmers market voucher program that would best provide nutritional information and vouchers for the purchase of healthy produce to their local communities. At St. Elizabeth's, diabetic patients from the St. Elizabeth's Medical Center's community receive vouchers to be used at local farmers markets to buy fresh fruits and vegetables. Participants are enrolled through the St. Elizabeth's Diabetes Education Program, where they have one-on-one sessions with the diabetes center nurse and dietitian as well as group sessions that provide instruction in healthy eating and portion control. 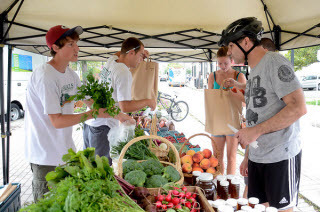 Participants’ health outcomes are monitored by the diabetes center to record improvements in health as a result of participation in the Steward Farmers Market Program. In addition, St. Elizabeth’s provided over $15,000 worth of vouchers to St. Mary’s Center for Women in Dorchester, Massachusetts, to help them develop their own voucher program. PAATHS Program. In 2013, in collaboration with the Boston Public Health Commission’s PAATHS Program and Carney Hospital, St. Elizabeth Medical Center developed a Substance Abuse Navigator Program, an enhanced resource and referral resource for individuals with substance abuse disorders – particularly those identified as most at risk for fatal and non-fatal overdose. The PAATHS program manages a navigator who identifies needed services and supports and provides linkages to care that address all of the clinical and non-clinical care needs of the individuals. The navigator, who works on a rotation at St. Elizabeth’s, Carney Hospital in Dorchester, Massachusetts, and the Boston Public Health Commission’s facility, effectively links active substance users with clinical services that incorporate primary care, social, and mental health services and will improve engagement, retention, and adherence. The presence of a staff resource dedicated to substance abuse issues greatly supports primary care teams at the partnering health facilities.